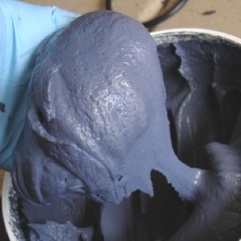 Spectrum Sludge™ is the thickest noise and vibration paste on the market. One coat is all you need to achieve the minimum effective thickness of 1mm but a total thickness of up to 4mm can be applied in a single coat if desired. Simply add a bottle of Spectrum Sludge Activator (included) to a gallon of our regular Spectrum coating to change the viscosity from chocolate syrup to peanut butter. Spectrum Sludge is a super heavy duty, paste-type sound and vibration dampener that is very easy to apply. Just a single coat of this sound proof super sludge can result in heavy noise reduction, inside your car’s cabin. Altering the viscosity of this super sludge, to match your specific needs, is as easy as adding the super Spectrum Sludge Activator (included) to a gallon of Spectrum (included). The super activator can instantly transform this super sludge’s viscosity from that of thick chocolate syrup to that of peanut butter, to allow for customized use. A step by step guide on how to properly apply Spectrum Sludge from start to finish. The Spectrum Sludge is shipped as a two-part product. You will receive a gallon of our Spectrum paste, along with another bottle called the Spectrum Sludge Activator. Depending on your needs, you can add how much ever of super activator into the sludge, to increase its viscosity. The more activator you add, the thicker Spectrum Sludge that you will get. Please note that adding the sludge activator will increase viscosity but not alter drying times or setting times. Spectrum Sludge, even with a little bit of activator added, is too thick to apply with a spray and one will have to use a putty applicator or even a brush to coat this sludge onto sheet metal. If you have an aftermarket, sound system, then you know that a lot of the musical energy is spent, and even wasted by vibrating and flexing the your cars metal panels. Not only are these vibrations loud, and obnoxious, but they also limit the potential of your stereo. Since it is a vibration damper it will obviously reduce the panel vibration caused from your speakers allowing your music to sound clearer. It also strengthens the cars panels. With stronger, non flexing panels, the energy is no longer being wasted and stays inside the car, making your music louder, clearer and less obnoxious to those around you. Anything you place in front of the heat source will help reduce or slow down the heat. Spectrum Sludge will help reduce heat to a small degree but is not specifically designed to do so. Any heat reduction noticed from Spectrum Sludge is purely a side benefit, not an intended result. If you are looking for thermal insulation, check out our Thermal Block or Luxury Liner Pro is also a great thermal insulator. Alternatively, one of our self adhesive insulation mats; Damplifier or Damplifier Pro. Spectrum and Sludge are nearly identical. The only difference is the viscosity. Spectrum has the consistency of heavy chocolate syrup and is easy to spray, brush or roll on. Spectrum Sludge has the consistency of peanut butter and is too thick to spray, but can easily be applied with a putty knife, trowel or paint brush. How long does Spectrum Sludge take to cure? Like all water based products Spectrum Sludge will take 30 full days to cure but will be dry to the touch in 30-60 minutes and mostly dry within 1 week. We suggest that you allow a minimum of 2 days for Spectrum Sludge to dry before reinstalling your upholstery. What is better, Spectrum Sludge or Damplifier Pro? Both products are designed to do the same basic function; reduce noise through the reduction of vibrations. Both have their place, and both excel at specific frequency ranges. This is why we suggest using a combination of damping mat and coatings. We suggest using Damplifier Pro as your base foundation inside the car, on all the panels hidden by upholstery, then use Spectrum Sludge as an undercoating on the underside of the cars floor pan. This will sandwich the sheet metal floor between Damplifier Pro & Spectrum Sludge, allowing for the ultimate approach in vibration deadening. Does Spectrum Sludge Activator speed up the curing time of Spectrum Sludge? No. Spectrum Sludge Activator is only a thickening agent, not a curing or hardening agent. With or without the Spectrum Sludge Activator, Spectrum will have a shelf life of 6 months once opened and will cure in 30 days once applied.